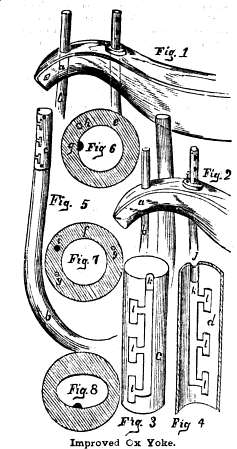 The invention herewith illustrated provides an ox bow which will not bear upon the windpipe or the veins or arteries of the neck and has been patented by Mr Luman Rundell, of Grapeville NY. The bow as represented is formed partly of wood and partly metal, the metal portion being made tubular and forming an enlarged lower part of the bow, which is of sufficient size to relieve the lower part of the throat of ox from any pressure of the bow. It may, however, be made entirely of wood bent into the form shown, even of a piece of gas pipe bent into suitable form. This is the first of several book overviews I plan to do on ox related books. I am in no way a literary critic, but I thought people might benefit from a brief description so as to know what to expect from a particular book. 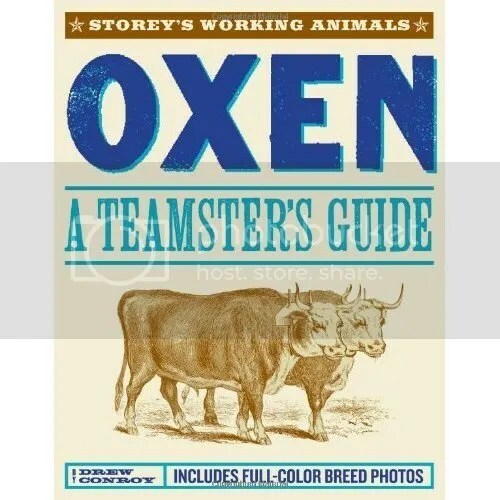 Oxen..A Teamster’s Guide is the latest book on oxen by Drew Conroy. I suspect very few people, if anyone, has spent as much time studying oxen, their history, and their use as Drew. I am certain that no one else has written so much on the subject. What’s more, he is, himself, a Devon man. I have heard this book frequently referred to as the “ox bible”. If such a thing exists, then this is it. It’s just shy of three hundred pages broken up into no less than nineteen chapters covering such subjects as history, health, hoof care, training, housing, equipment, working, and international development to name a few. Its pages are full of informative pictures and illustrations. It also includes three appendices covering breeds, yoke and bow sizes, and nutrition. I thought I had heard just about every ox term at one point or another, but the glossary had a number of them that proved me wrong. A great touch to the book is the “On The Farm” pages where Drew gives a personal account of particular teamsters that he has met in his extensive travels. It doesn’t hurt that page seventy-seven is committed to my father! On the back cover the book is labeled in big bold letters, “OPERATING MANUAL FOR THE MIGHTY OX” and that is just what it is. If you are interested in oxen then this is a must read. How to measure and fit an ox yoke. Yokes are typically made in sizes 4″ thru 12″. The size refers to the width of the bow as measured from inside to inside of the bow holes. To measure your animal, place a stick on either side of the animal’s neck where the yoke would sit at rest. While keeping them parallel, have a helper measure the distance between the sticks. If you have two framing squares you can rubber band them together to create a big set of calipers and take the same measurement. Most yoke makers will use the bow width to calculate the distance between the oxen in a double yoke but if you feel it necessary, you can measure the widest part of the animal’s belly the same way you measured the neck. One quick way to check for a properly fitting yoke is to slide your hand flat between the bow and the animal’s neck. On a small yoke, the tips of your fingers should fit. On a medium yoke, the base of your fingers should fit and on a large yoke, the palm of your hand should readily fit between the neck and bow. More importantly, you should watch how the yoke fits while working your cattle. In a hard pull, the bow should slip between the animal’s shoulder and neck. If the bow hits the point on the front of the shoulder, the bow is too wide and will cause damage and discomfort to the animal. The bow’s height should be adjusted so that when at rest the bow is slightly pulling up on the dewlap but not pressing into the meat of the neck. The esophagus is protected by muscle in the neck but between the neck and brisket it is exposed. Using a bow that is adjusted too low will cause damage and discomfort to the animal. Inexperienced teamsters have a great tendency to use yokes that are too big and bows that are adjusted too low. It is better to error on the side of having the yoke too small or the bows too high. Don’t be tempted to skip a size. You can’t expect an animal to give their all with ill-fitting equipment. I have been researching and collecting quite a bit of information on patents for ox equipment including yokes and bow keys ect.. They frequently call their invention an “improvement” for obvious reasons but usually all they did was complicate a simple piece of equipment. Many times it seems that they created more problems than they solved and sometimes I feel they took a giant leap backwards. I did find this one to be interesting and wanted to share it. In all history, the ox is associated with man as his faithful servant. The horse has been rather man’s companion; and, therefore, caressed and apostrophized. And when it has been found necessary to take him from the chariot to the wagon, every care has been taken, both in an anatomical and mechanical point of view, to have his harness constructed soft and flexile and on the best principles. None, or but little of this care has been taken in connexion with the ox. It is true he has been worshipped as a God, and sacrificed to the gods, but he has never been caressed- has never, when he has been whipped and cudgelled, had any of those good-natured apologies made to him that, after ill-treatment, are usually made to a horse. If his harness, by its malformation and rudeness, pained and lacerated his flesh it made no matter- he was only an ox. And yet in man’s sober moments- perhaps we should say in hs lazy moments, when he had nothing to do but pity- this consideration and treatment of this truly useful animal, has been mourned over and condemned. It now must give to all men real pleasure to see what this pity gives us, as in this last view of the case, we know it has at last mercifully worked itself into form- into real practical alleviation. It is but a few years since a yoke was invented, by which the oxen can walk closer or more apart as the inequalities or other circumstances of the ground, may make it desirable. And now, we have another and more important improvement in this second new yoke, of which the above is a cut. If the first, or sliding yoke, is a convenience to the oxen, this yoke embraces a principle of mercy as well as of mechanical improvement, as in it the oxen’s shoulders cannot possibly be chafed or mangled, as they too frequently are in the old or common yoke. In this yoke the neck blocks are separate from the beam, and attached to it by strong bolts passing from an iron thimble or socket in the block up through the centre of the beam, as represented at the letter B. This iron thimble or socket, is an improvement upon which application for a patent is now being made by Mr Dederick. This yoke has five decided advantages over all others. First. By the neck block accommodating itself to whatever movement of the ox, it is impossible for his shoulders ever to become sore or broken. Second. It does away with the evil arising from one ox stepping in advance of the other; as, by the moving of the blocks, the weight must under all possible circumstances fall equally on both oxen- except, (which is the Third advantage,) when desiring to favor one you may move him one or more holes farther from the centre than his fellow. Fourth. By moving the neck blocks into either of the five holes, (represented by dots in the beam below,) it can be changed at pleasure into a yoke of any width required for ploughing, carting, sleighing or hauling; which advantage of itself makes its value equal to two or three of the common yoke. Fifth. Bows in this yoke will last much longer than in any other, because the tugging or jerking of the ox does not fall on the bow, but directly on the centre bolt. The bows are secured by keys passing through the bows and neck blocks represented at A.A.- there being in each two or more holes, so that the bow can be raised or lowered at pleasure. These yokes are manufactured by Peering & Dickson, of the premium works at Albany; and we believe are for sale by Paschall Morris & Co., of this city. We believe its price, (patent right included,) is seven dollars; and we feel that we should not conclude this article without saying, that when the great ease and advantage it to the oxen is considered, no intelligent or humane farmer should allow the two or three dollars difference price between it and the ordinary yoke, to make him hesitate a moment in its purchase. Here is the actual patent for the yoke. I find this yoke interesting. It is a slider yoke that uses a different mechanism than most, but the adjustable staple is particularly interesting. Those who have witnessed the practical every day work on a farm must have been struck with the imperfect means by which oxen are usually attached to the yoke and how severely it taxes them at times not only by its weight but because of its rigid and unyielding nature. The usual pace of the ox is slow and stately and in his progress he naturally swings his ponderous head from side to side with even measure but with the ordinary ox yoke all this is denied him and he must literally bow to his yoke and bear its burden as best he may. The consequences of this badly arranged ox yoke are that the beast is chafed and fretted by it that he works with much less willingness and gets wearied out sooner than he would if the yoke were adapted to his natural habits. In the engraving herewith presented we have a yoke which is very different from the old-fashioned one and much better suited to the peculiarities previously alluded to. In addition to this consideration, it is very much lighter neater looking and it is believed altogether a great improvement. In Fig 1 we have an elevation of this yoke in A is the yoke proper and B the bolster or saddle which spans the beast’s neck. These bolsters slide back and forth on the yoke being connected in the manner shown in Fig 2. By referring to this figure the reader will see that there are grooves C in the yoke and that the bolsters have projections D which fit in them; he may also see that there is a metallic bar E connected to the bolsters on the yoke; these bars are strongly fastened to the endless belt F which runs upon the rollers G. It is easy to see as the bolsters are moved back and forth on the yoke the belt will run over the rollers and cause them to work evenly and easily as often as the oxen move their heads. Uneven roads and the natural habits of the ox are thus accommodated and the result is a much greater amount of work with less fatigue to the cattle. The bows H also pass through metallic bushes I and the yoke beam has slots J in it through which the bows move as the bolsters approach or recede from the center. The eye bolt in the center is also fitted to a semicircular seat and the plate K has slots in it also so that it can slip from side to side. This yoke is very strong and well made; it is correct in principle and we hope to see it generally substituted for those so long in use. It was patented on the 4th of November 1862 through the Scientific American Patent Agency by TD Lakin and assigned to himself and Charles Wilder of Peterboro NH For further information address Charles Wilder as above.